Adulting is hard. Here are 15 hilariously relatable tweets to help you through the tough times. How do you know you're adult? When the first thing you check on your phone in the morning is LinkedIn notifications? What about how genuinely excited you are to look forward to a weekend - a full 48 hours - of absolutely zero social interaction - just you, your Netflix and Zomato Order. Do you always make plans for the weekend then secretly pray for the other person to cancel so you can stay home in your PJs all day? If that's your idea of bliss, congratulations, you've just proven yourself to be an adult. If you find yourself checking your work emails at a bar or shaking your head at "kids these days," this list of tweets is for you. You know you're an adult when 4:30am is early in the morning instead of late at night. You know you're an adult when you wake up on time to get ready for work, without an alarm. You know you're an adult when you can have milk and cookies for breakfast and have no one to tell you no that's not healthy.. Remember, just because you grow older doesn't mean you have to grow up! 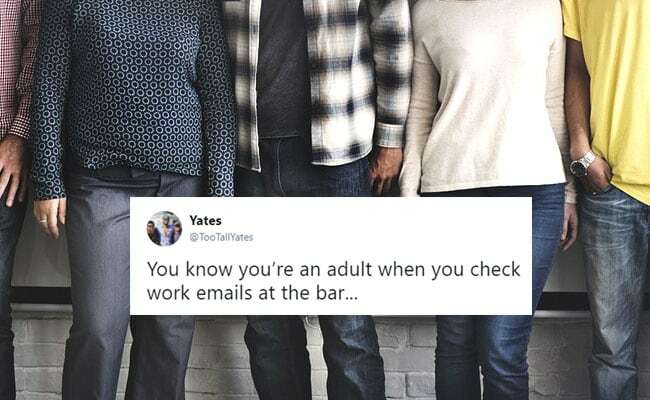 Which tweet about adulthood did you find the most relatable? Let us know in the comments section below.